Over the past twenty years, the financial services sector has been one of the pillars of the Irish economy in the period of unprecedented growth. One of the effects of a growing industry is an increase in the demand for appropriately skilled labor to take care of the high levels of service required by clients. Further, recruitment of staff from the European Union member states has been attributed to some of the shortfalls. However, it is necessary to take advantage of the potential candidates in non-EU countries to maintain the continued delivery of excellent services. Some industry representative bodies presented submissions to the Enterprise, Trade, and Employment Department before the publication of the Ireland Green Card Permit Scheme made public by the Minister on 24th January 2007. The new Ireland Green Card Permit Scheme allows a citizen of a foreign country to be employed by a listed employer in an outlined occupation. These new arrangements will enable employees to apply for immediate family reunification and will allow applications for a permanent stay after a period of two years. It will be substantial for the foreign national involved to have the necessary qualifications, experience, or skills and also have a job offer from an identified employer who is registered with the Revenue Commissioners and the Company Registration Office. The Green Cards will only be given based on job offers that last two years. The initial application will cost 1000 Euros. After two years, the Green Card may be renewed indefinitely for 1500 Euros. The spouses and dependents of the Green Card Permit holders are allowed to seek employment opportunities as well as apply for a dependents/spousal work permit as long as they are legal residents in Ireland. 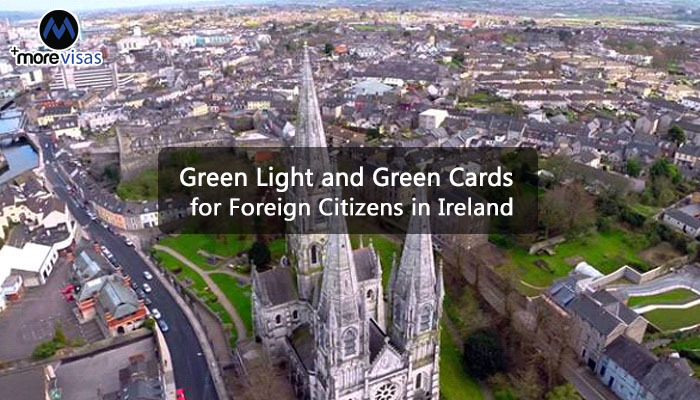 When a foreign national is issued with a Green Card Permit, they are expected to acquire an entry visa from their local Irish Consulate /Embassy. Once they arrive in the country, they must be registered with the National Garda Registration Office to receive the appropriate permission and proper immigration status to be allowed to remain in Ireland. Moreover, this new scheme will grant spouses and dependent children below 18 years of age the chance to apply for work permits without necessarily conducting a market needs test. In line with this, no fee will be charged for such an application. Besides, the applicant must be a legal resident in Ireland by being dependent on the employment permit holder.